Apple's next Activity Challenge for Apple Watch wearers will be centered around Earth Day this Sunday, April 22, with notifications that should begin appearing on Friday, April 20. The Earth Day Challenge requires you to do any workout for 30 minutes or more on April 22, and record your activity within the Workout watchOS app or any other app that adds workouts to the Health iOS app. 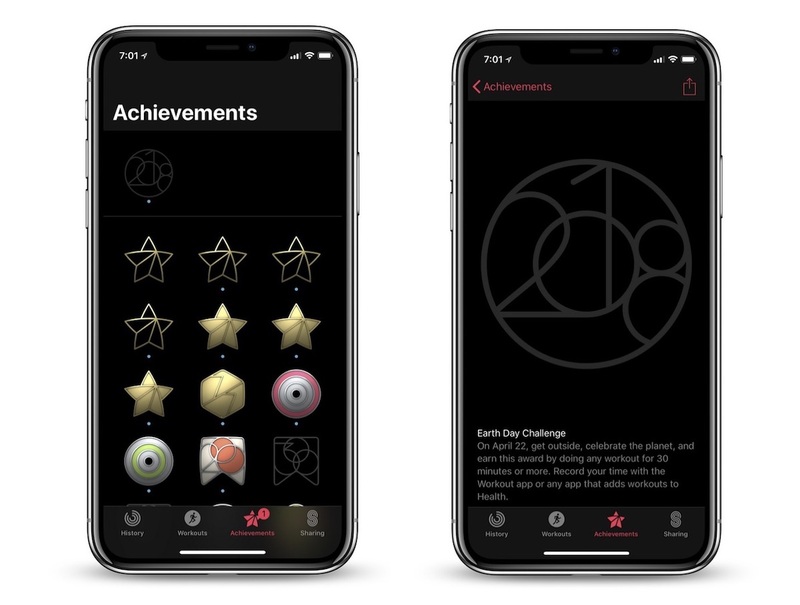 As is tradition with Activity Challenges, once you complete this feat on Earth Day then Apple will grant you a new achievement badge within the Activity app on iPhone, as well as various iMessage stickers that you can use to decorate your messages to friends and family members. 2018 marks the second year Apple has launched an Earth Day-specific Activity Challenge, and its goal is the same as it was in 2017. Apple will be celebrating Earth Day a variety of ways this upcoming week, with employees in retail stores again wearing green shirts instead of traditional navy blue as a way to mark the annual environmental-focused event. In the past, Apple has marked Earth Day by adding a green leaf accent to the Apple logos of its retail stores, and shared Earth Day videos, Apple Music playlists, and featured apps in the App Store. For Activity Challenges, this is the fourth one in 2018, following a Ring In The New Year Challenge in January, Heart Month Challenge in February, and International Women's Day Challenge in March. If Apple keeps following its annual Activity Challenge schedule, the next physical trial for Apple Watch owners will take place around Mother's Day in May. Just curious...won't working out increase breathing rates, dumping more toxic CO2 into the atmosphere? Only 30 minutes? I'm far from being any sort of specimen of physical fitness and am still a bit chubby, but I think it's kinda sad that most people don't get the recommended 30 minutes each day. It's worth the effort and small time sacrifice to feel better. It's amazing the improvement in well being, lowered weight, and lowered blood pressure I saw last year by adding 30-45 minute fast-paced walks, sometimes with interval sprints mixed in to raise my resting heart rate each day. I just do this over lunch and sometimes in the evening in my neighborhood. I also mixed in a few exercises that are easy to do in my office and only take a couple minutes each, such as pushups, dips, squats, etc. I do those about every two hours with a silent alarm that I have set on my iPhone. It really doesn't take much effort to make a big difference if you're really out of shape. Plus you got your award (and no-one ever died from a blister :)). Well, no, I didn't get the award! And what if my blister turns septic??? Some suggest 10-15 min high intensity workout where you actually raise your heart rate, is better than a 30 minute passive workout.